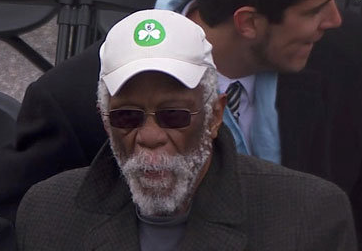 The 57th Presidential inauguration was held this morning (I was there) and for some reason, Celtics legend Bill Russell was in attendance. I'm not sure why he was there but it sure was cool to see him. Unfortunately for him, George Stephanopoulos, who was co-anchoring ABC's coverage, had no idea who he was. Let's go to the videotape. Morgan Freeman. Good call, George.